Summertime … and anticipation builds as festivals at Toronto, Venice, Locarno, Busan, London (BFI), and Melbourne, are on the horizon. It is in sweltering June-July that these festivals zeroed in on Mumbai to seek out spanking new films and those in post-production. This year, the Indian Film Festival Stuttgart is special, with 2018 marking 50 years of Stuttgart city's twinning with Mumbai. Encouragingly, there is a rich tapestry of regional films on view. They range from, our venerable whimsical weaver of surreal tales, Buddhabeb Dasgupta's latest, to the fiery spark of Mumbai’s Leena Yadav, her new film, a complete departure from her earlier hit. There are new films in Tamil, Malayalam, Marathi, Assamese, and of course, Hindi. 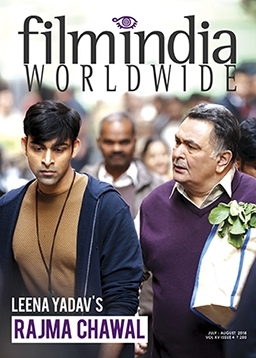 They reflect the Indian film scene's multilingual, multicultural spectrum that opens windows to the country's layered lifestyles. This issue presents a kaleidoscope of new Indian cinema that impacts our imagination and minds.